When I was growing up my mother used to make these Jewish Hanukkah cookies every year. They’re a holiday tradition for both Hanukkah and Christmas. 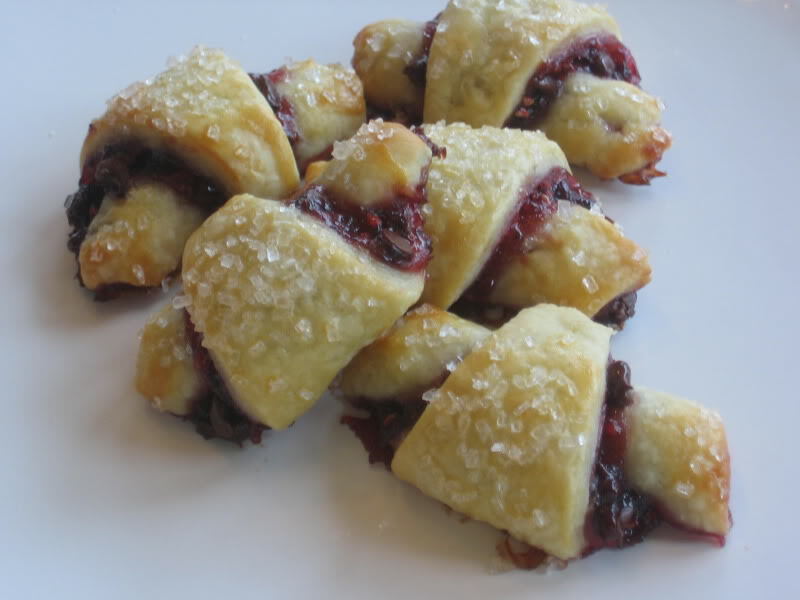 Here is my mother’s Rugelach recipe. Enjoy! In a large bowl, with an electric mixer on medium, beat cream cheese, butter, brown sugar, salt and egg yolk until light and fluffy. On low speed, beat in flour just until combined. Divide dough in half. On a lightly floured surface, shape each half into 1/2 inch thick circle. Wrap circles separately in plastic wrap. Refrigerate at least 2 hours or overnight. On a floured surface, roll 1 dough circle to 10 inch round. Spread 3 tablespoons jam evenly on top of dough. Sprinkle with 1/3 cup nuts then 1 tsp. cinnamon-sugar mixture. Cut into 16 wedges. With a spatula, slide 1 wedge out from the round. Starting at the wide end, roll up toward the point. Place cookie point side down on a nonstick baking sheet, or silpat or parchment paper. Roll up remaining wedges and place on cookie sheet. Repeat with remaining circle of dough. Bake for 15 minutes until lightly browned. Remove from oven and remove to wire rack to cool. Combine above ingredients and instead of using jam and cinnamon-sugar mixture, sprinkle half of the nut mixture over circle and press onto dough lightly to adhere.